Fr John was born and brought up in the West Riding of Yorkshire at the heart of the famous Rhubarb Triangle! Rather than follow his farming father into the rhubarb business, Fr John went to read Theology at King’s College London and lived and worked in south London for eleven years before moving to Wales in 1992 to study for the priesthood at St Michael and All Angel’s Theological College at Llandaff. Ordained to the Diaconate by Bishop Rowan Williams in 1994, Fr John served his title in the Parish Church of St Mary-the-Virgin, Caldicot before moving to serve a second curacy in the Parish of Risca, with our now Bishop Richard as his training incumbent. In 2000 Fr John was licensed as Vicar of Llantilio Pertholey with Bettws Chapel and Llandewi Skirrid on the northern edge of Abergavenny where he served for five years as incumbent. During his time there Fr John worked closely with the local Church in Wales Primary School, where his two children were pupils. Fr John then moved to work in the Diocese of Oxford, in the Church of England, serving as Priest-in-charge of St Paul’s, Wokingham, a post he combined with serving as Chaplain to the then Bishop of Reading, Bishop Stephen Cottrell. 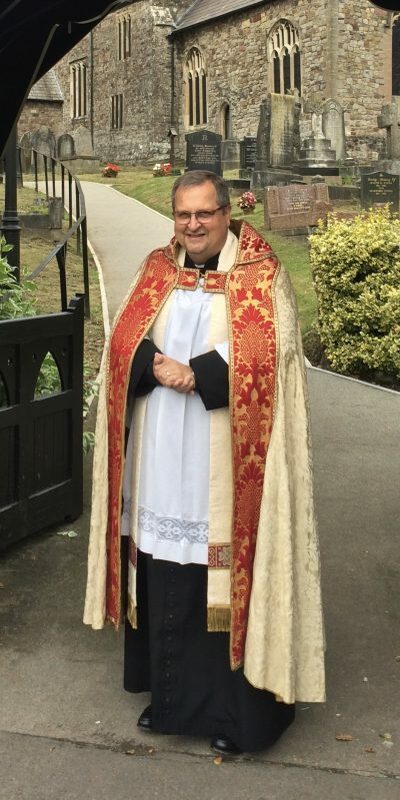 Following a year in hospital chaplaincy at the Royal Berkshire Hospital in Reading, Fr John then served as Rector of Chingford, in north-east London, in the Diocese of Chelmsford. Feeling called ‘home’ to Wales and the Diocese of Monmouth, Fr John was licensed as Priest in Charge of Rumney in 2015. During his incumbency, the 12th century church of St Augustine has been completely, renovated, restored and re-ordered to make it better serve the needs of a growing congregation and the wider community. In 2017, Bishop Richard appointed Fr John as Area Dean of Bassaleg and he is also the Ministry Area Leader (designate) for the parishes of Rumney, Llanrumney, St Mellons, Marshfield and St Brides as the parishes seek to work together more closely in mission and ministry. Fr John was elected to serve in the House of Clergy in the Governing Body of the Church in Wales from April 2018 and has been a member of the Standing Liturgical Advisory Committee of the Church in Wales since he returned to work in the Province. Fr John is passionate about helping the Church to understand the importance of the relationship between worship and mission and believes in building healthy, welcoming, inclusive Christian communities where people can bring their questions and explore their faith. Fr John has two grown up children, Adam and Charlotte, recently acquired a daughter-in-law when his son got married and is happily and civilly partnered to his partner Claudio! When he has time Fr John loves enjoying the rich musical scene of Cardiff or spending time cooking and entertaining for friends and family. Error: Error validating access token: Session has expired on Saturday, 06-Oct-18 08:26:18 PDT. The current time is Sunday, 21-Apr-19 11:31:41 PDT.